After being forwarded an invite from charter organiser Richard Newton, I signed up and attended my first steam photo charter. This is where a train is hired for a day and shuttles up and down the line for the exclusive convenience of railway photographers. These are not publicised (so that free-loaders can’t join in without paying) and are during the week, so as not to interrupt regular weekend running. 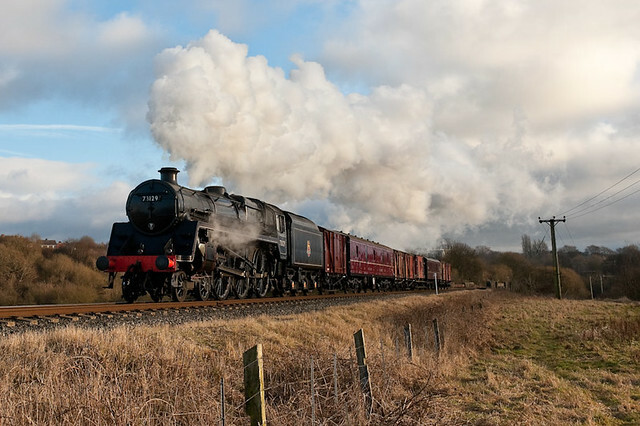 I’d seen many photos from these in the past, and often wondered how to get on one, but thanks to Nigel Valentine who helped organise it from the East Lancs Railway end, I sent off my cheque and turned up to see what happens! The beauty of these charters is that the train can be put in the right place at the right time for the best light, and then if needs be, reversed up the line for another run past, and then if needs be, another. And another if required. And of course, if you want some dramatic smoke effects, then that can be arranged as well! Awesome! Despite the sky looking promising, the light just didn’t work out for the early morning Burrs shots, but thankfully, it played ball later in the day when it was shining from the other side! I’ve used this spot a few times before, most notably at Christmas which ended in a miserable failure. Here, the wind was more favourable! And so on a few hundred yards up the track. Normally, to capture the same quality of late afternoon light would have required turning up again on a different day and hoping the light would be good, but not on a charter! Just walk up the track, wait for the engine to reverse, and then do a few more run pasts! I don’t recall seeing many, if any, photos from this spot before. It’s been largely inaccessible due to the caravan site that’s been built a few years ago, plus it’s rather boggy. However, thanks to some great work by Nigel Valentine, some of the small hillside has been cleared, thus allowing a degree of access. In homage to this work, it’s now been christened ‘Valentine’s Valley’!! Finally, a slighty different angle on things. I’d like to have got the train a bit further along the line, but didn’t want that branch in the steam. Maybe a trip back with a pair of wellies and some shears is in order…..